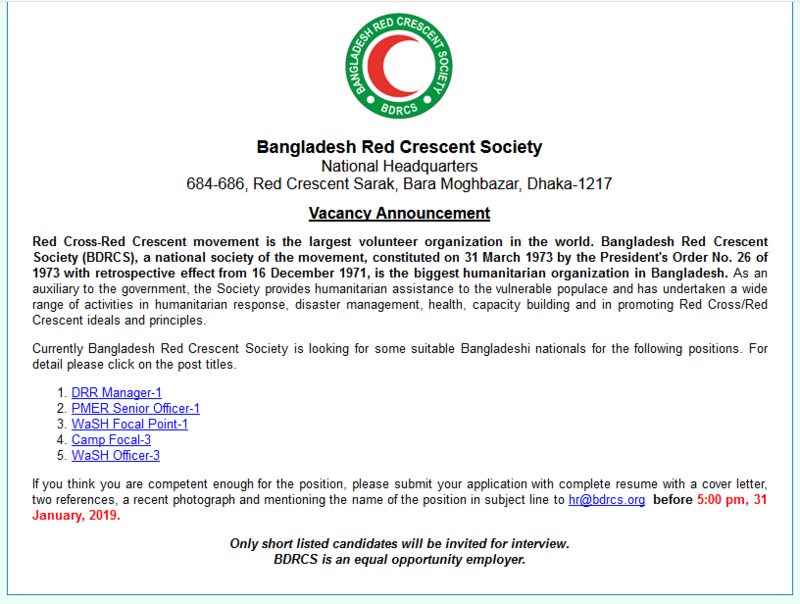 Bangladesh Red Crescent Society (BDRCS) published New job vacancy Notice at www.bdrcs.org. BDRCS job circular offer 09 New vacancy in this post. Bachelor`s Degree in Social Science student can apply this Bangladesh Red Crescent Society job circular 2018. You have to complete your BDRCS online application before 31 January 2019 at 05:00 PM. Bangladesh Red Crescent Society Job Notice, Exam Admit Card, Written Exam result published by www.bdrcs.org . When BDRCS official website published New Recruitment notice then you can also check BDRCS updates at ejobscircular.com . Bangladesh Latest Company jobs circular of BDRCS Full information available here. Let`s Check below BDRCS Job Information in July 2018. Positions: DRR Manager,PMER Senior Officer,Wash Focal Point,Camp Focal,Wash Officer. Candidate can easily apply BDRCS online application sending your CV to this Email [email protected] . For Apply You have to Ready your CV.If You want to apply www.bdrcs.org you have to visit there official website . You can Also download Bangladesh Red Crescent Society Job Circular Application Form at ejobscircular.com . For Next Updates about BDRCS job circular,Notice,Exam Result or Admit card Download stay with us. This entry was posted in bd jobs today, Company Jobs, Marketing Jobs and tagged Bangladesh Red Crescent Society Job Circular, www.bdrcs.org by ejobscircular. Bookmark the permalink.